The Rotary Club of Mill Valley, part of the influential service organization Rotary International, has had a particularly storied background. 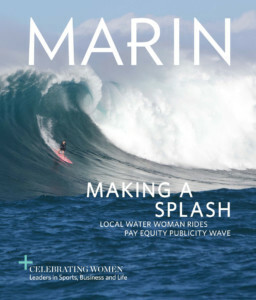 In 1987, it become the first club in Marin (and one of the first in California) to admit women as members. For many years, local Rotary Clubs were only open to men, so it was a bold move that almost got the 92-year-old club tossed out of the international organization. Today, the Rotary Club of Mill Valley is active in humanitarian projects around the world, connecting with international clubs to contribute their communities through humanitarian projects, whether it’s developing water systems, constructing buildings or providing wheelchairs. Marin Magazine’s advertising partner, Elizabeth Suzuki of Sutton Suzuki Architects, first joined the Mill Valley Rotary Club 20 years ago based on an invitation from Bob Canepa, the then-owner of Mill Valley Market, and has been an active member ever since. She has been involved with numerous projects, including helping at schools in Mexico, and more recently, working with Mill Valley Rotary Club President Bob Roberts to build greenhouses for families living in the Peruvian Andes, who she nominated for this social impact article. Bob Roberts first joined the Rotary Club in the 1960s in Mt Shasta. Since becoming president in Mill Valley, he has been particularly passionate about working in Peru. “I was a Peace Corps volunteer stationed in a similar Quechua-speaking community at 10,000 feet in the Andes in the 1960s,” he explains. Today, the Mill Valley Rotary is doing work to help farming families in this remote region thrive. “These indigenous farming families have been stuck in one of the most challenging agricultural environments in the world for over 600 years,” Roberts says. The greenhouses that the Mill Valley Rotary has helped build, for which Rotary International provides 1,800 adobe bricks and contracts the walls, allow the families to move from subsistence agriculture (potatoes and corn) to a vastly improved nutritional condition and market economy. Within one year, the families are consuming 60 percent of the fruits and vegetables they grow and selling the other 40 percent in the local markets. The result is a farming operation that is both more nutritionally sound and self-sustaining. The work of the club there can be difficult, as the culture is often distrustful of outsiders, but with the help of Peruvian NGOs, the Rotary enjoyed a warm welcome. Rotary volunteers got to enjoy dancing to traditional Andean music. “Swinging your partner in a pasture at 13,000 feet is a breathless experience,” Roberts enthuses. If you’d like to get involved with Rotary, visit www.millvalleyrotary.org.